The Army Medical Department Journal is a quarterly, peer-reviewed, professional publication with worldwide distribution. It provides a forum for the presentation and exchange of the most current, high level healthcare, clinical, and medical research information, as well as medically related combat experiences and military doctrine development ideas and proposals. 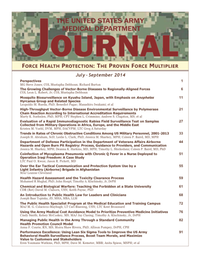 TheJournal encourages dialogue on important healthcare initiatives, seeks to expand knowledge of domestic and international military medical issues and technological advances, conveys clinical and health service support information, enhances the working relationships among the various medical corps and specialties, and promotes collaborative partnerships among the armed services. Articles published in the Army Medical Department Journal are indexed in MEDLINE, the National Library of Medicine`s bibliographic database of life sciences and biomedical information. The indexing ensures that citation information for articles by Army and other military medical professionals published in the Journal are readily accessible throughout the global scientific and academic communities. The AMEDD Journal now shares this distinction as part of MEDLINE with the world`s finest medical science periodicals. Inclusion by the National Library of Medicine is another recognition of the high quality of content and presentation that has become the standard for the AMEDD Journal, Army medicine`s premier publication. The Army Medical Department Journal fully subscribes to the principles and standards of the Uniform Requirements for Manuscripts Submitted to Biomedical Journals (International Committee of Medical Journal Editors, 2008) with regard to potential conflict of interest in the preparation, review, and publication of articles; the privacy and confidentiality of information of patients and study participants; and the protection of human subjects and animals in research. Those areas of concern are detailed in the document "Authorship and Review Standards for Manuscripts." ...Supporting Documents section of this page. Further, specific requirements addressing those areas for submission of manuscripts are on the inside back cover of each issue, "Submission of Manuscripts to the Army Medical Department Journal." ...Supporting Documents section of this page. Provide a forum for the presentation and exchange of the most current, high level healthcare, clinical, and medical research information, as well as medically related combat experiences and military medical doctrine development ideas and proposals. Vision: Publicly present military medical professionals as bona fide contemporaries at the highest levels of the worldwide medical and biological science communities in practice, research, and scholarship.